Every week I choose one of my favorite photographs of the week from my Fine Art landscape, flower and macro photography collection and offer it throughout that week at a discounted rate. 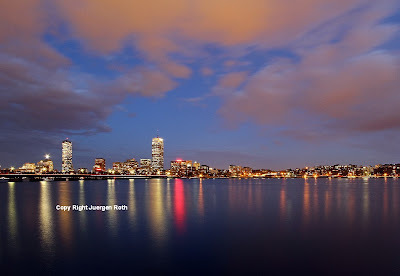 This week's photo of the week on sale is Opening Night displaying Boston skyline photography at its best. The skyline twilight image was captured 30 to 45 minutes after sunset when the sky still showed plenty of blue and the clouds became alive. Starting today through the week of 23 April 2012 this image from my Skyline Photography Gallery, available as art print, acrylic, or on canvas, is on sale.